Simon Peter asked, "Lord, where are you going?" And Jesus replied, "You can't go with me now, but you will follow me later." "But why can't I come now, Lord?" he asked. "I'm ready to die for you." Jesus answered, "Die for me? 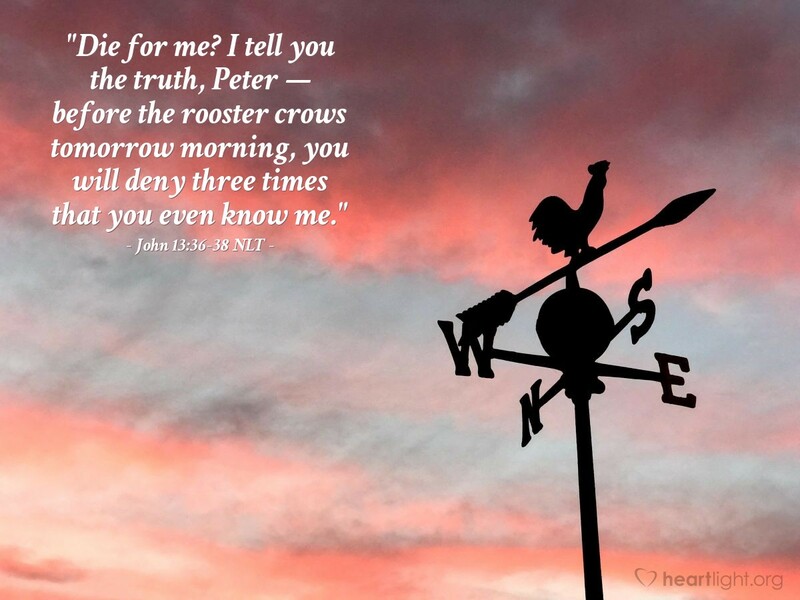 I tell you the truth, Peter — before the rooster crows tomorrow morning, you will deny three times that you even know me." Most of us have done it. We've overstated (or at least, overestimated) our commitment, abilities, or strength. Our intentions, at the time, were probably good. We just didn't realize Satan's power to combine circumstance, fear, doubt, disillusionment ... in a concoction brewed just right to bring us to our knees. Peter had a tendency to overstate everything in his early years as a disciple. However, once Peter suffered through his personal embarrassments and failures, Jesus had a disciple fully prepared to lead powerfully while also walking humbly. Let's not let our failures keep us from following Christ and being used for his glory. In addition, let's not overstate our ability to handle temptations, trials, difficulties, challenges, or problems. God's strength is made perfect when we realize our weakness and vulnerability and then rely on his strength to sustain us! Father, please forgive me for the times I've failed after I overestimated my ability to handle a problem. I know that I cannot face the challenges of life and faith without your power and presence. Strengthen me for the days ahead so that I can be a blessing to others and honor you with faithfulness in my life. In Jesus' name. Amen.